This frame features a set of authentic Sidney Crosby 2007 NHL All-Star jersey numbers which have been personally signed by the Pittsburgh Penguins captain himself. The numbers in the frame are game-ready numbers, the same as you would see on any officially licensed jersey. 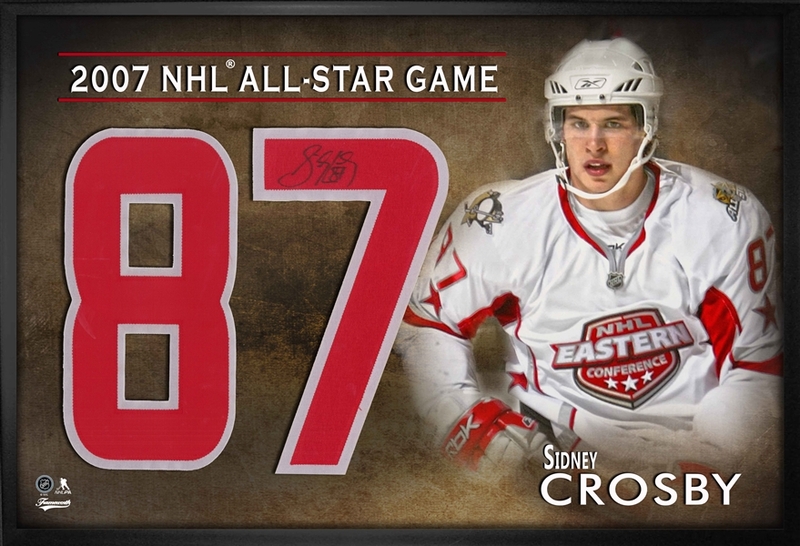 This frame was created to commemorate Sidney Crosby’s very first NHL All-Star appearance which was in 2007 in Dallas at the American Airlines Arena. The frame is signed on the `7`of the authentic #87. After missing the All-Star game the year before due to the Olympics, Crosby was finally able to participate and display his All-Star abilities. In the 2006-2007 season Crosby put up some of the best numbers in his NHL career. Playing in 79 games during the season Crosby scored 36 goals and recorded 84 assists for a total of 120 points. That was not all for Crosby’s All-Star season. At the conclusion of the 2006-2007 season Crosby was awarded the Art Ross Trophy, given to the player with the league leading points. He was also recognized as the most outstanding player being awarded the Ted Lindsay Award and Hart Memorial Trophy. Since then, the three time Stanley Cup Champion has won a total of 12 awards including adding another Hart Trophy. Crosby’s successes led him to being named one of the “Top 100 Greatest Players of the Century” by the NHL during the 2017 Centennial season. Not only has Crosby excelled in the NHL but he is also a two time Olympic Gold Medalist and World Cup of Hockey champion. Frameworth is the exclusive memorabilia and autograph provider of Sidney Crosby. A hologram and certificate of authenticity are included. Finished Size: 18x26”.